Do you have a discord for this project? We're presently using the Minecraft Abnormals community Discord, on which we have a specific channel for Community Revamp. It can be found here. I've split the Detailed Content List into a new document accessible through the regular Concept Sheet, as well as began to stat out some of the Combat Pack and Aquatic Pack content. Future specifics of content should go here. We should be wrapping up ship-related content about now, but here's a riverboat anyways (spawning in lakes and rivers, not the oceans). That's good, but I think we should call it the "sailing" pack so it is separated from the features from Ocean Improvements 1 & 2. I think each of the large packs should have smaller "additions". When you download said pack it will ask you if you want the additions (by default they are yes). 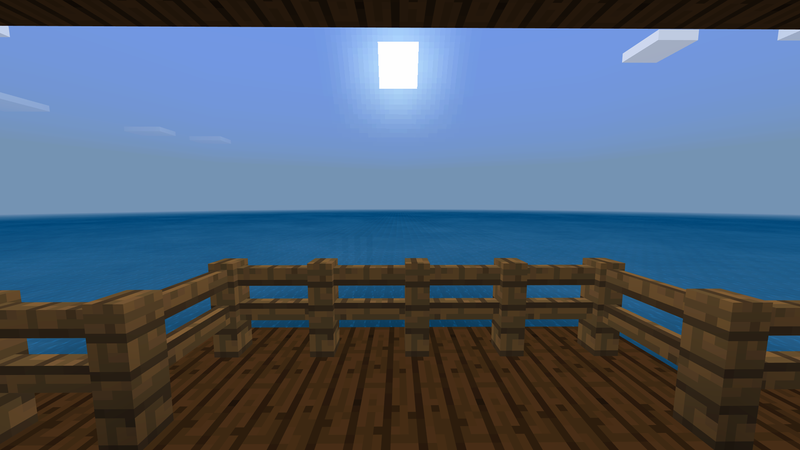 For example, the Aquatic Pack would have a Sailing Addition. The Nether Expansion Pack would have a Nether Civilization Addition. I see. This could work similar to how the Quark Mod has modules, but has a config file where you can enable/disable individual features. My suggestion is an improvement to the cave systems. They come in three parts, two by me. The first is the Faunatic Update by Skull023. Another is while the other is something I've already posted, the Spider Nest suggestion. The last is a brand new one, the Dark Lair suggestion(comment on a better name), which will add a new generated structure, the Giant Cave, which contains several bats and a new mob, the giant bat. The Giant bats lair, containing many bats(comment how many). Looking like the caves you find in Anthem, this huge place is covered with bats, bats, and bats ex food(bone blocks). The giant bat will attack once the player enters this new structure(yes it is a generated structure), and will stop once the player leaves. The giant cave will be connected to other cave systems, meaning players could stumble upon it randomly while spelunking. 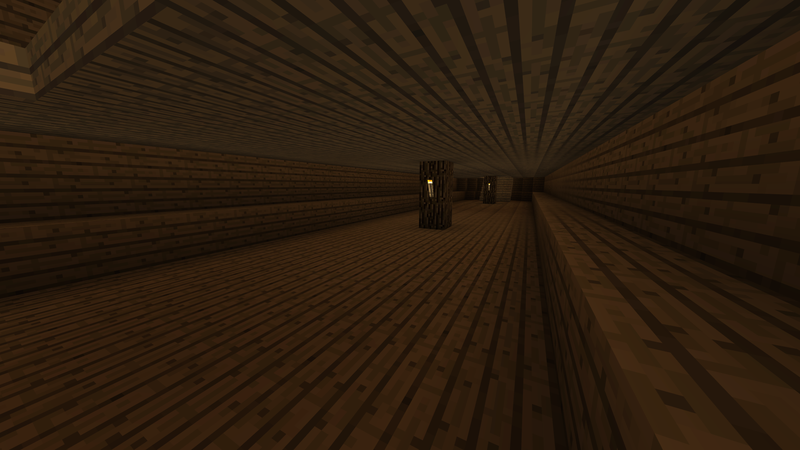 It will spawn about 50 blocks below sea level. Once you have damaged the large bat to where is has about 4 hearts left, it will fall to the ground(not taking fall damage), and it won't get up nor move. You are presented with two choices. 2. You can feed it raw meat(1-10, 40% chance of success until 10, where it is guaranteed), and it will begin to crawl around and not attack you. You can then start the regular taming process(You climb, it bucks you off, repeat.) Then, it will become your own flying mount. The Giant Bat will now follow you around like a dog. It has four modes, crawl(default), stay, hover, and fly. While in crawl mode, it will bend its wings and can fit in any gap the player can. In stay, it will be in crawl mode, but will not follow you. Hover will be activated if you get off of the bat while riding, or if you right click it twice rapidly. It will then go fly around in a 15 by 15 by 15 square, the center being where hover was activated. Fly is fly. Right clicking it while it is in any mode will make it go into fly mode. Riding the giant bat is simple. You just mount it with a saddle and you're off! Unless you're riding in daylight, in which case, you will fall off of the bat and it will flee to the nearest shaded area. This can be avoided by armoring it with bat armor. It can be crafted by placing leather in every corner except the top two corners of the crafting table. Bat armor will also give your giant bat two armor points. The bats can also be given a chest, and will carry as much as a donkey would. Bats can also be named with name tags. Ahhh, good improvements for bats. I think this collaborative project be good. 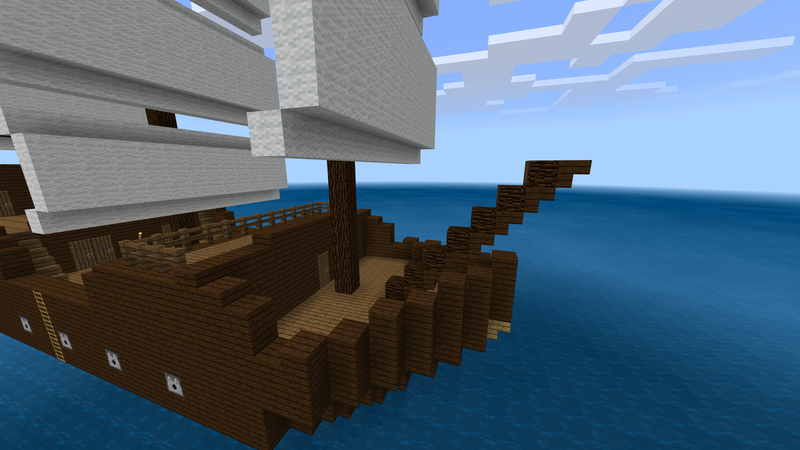 I am almost finished with the galleon. I will post pictures of it soon. That's a lovely vessel, can't wait to see it especially with block-to-block lead rigging. I think I will redo the Caravel itself to be less boxy and more ship-shape, but for now I'm centered around recovering my PC from a System Refresh (gee thanks windows updates!) plus Russians stealing my ancient 2011 Yahoo account that originally backed up Minecraft (long story, but it's working now). That looks awesome! 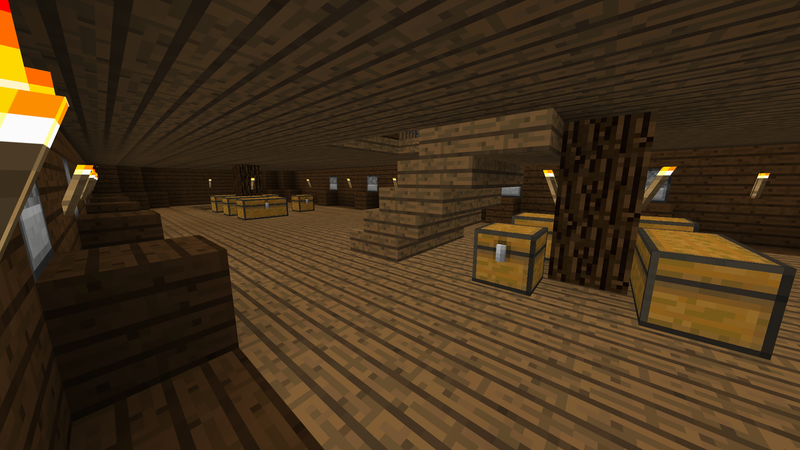 I really like how you added extra details with the logs in the lower decks. 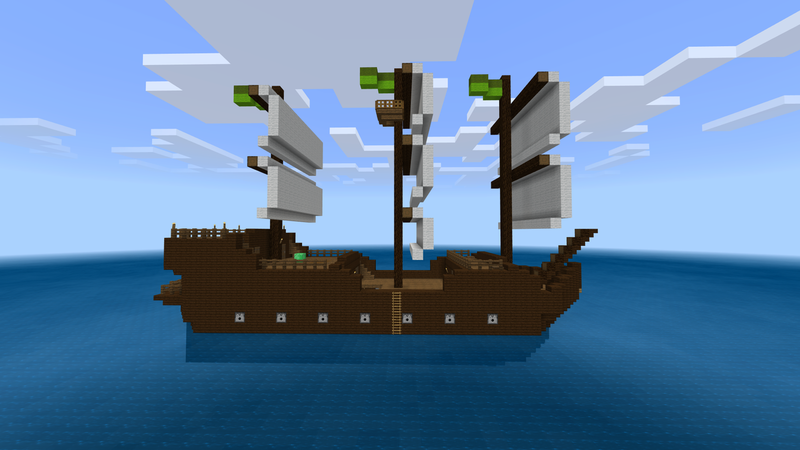 Edit: Here is the galleon! First I would like to make note on what exactly I've used for reference to build this ship. 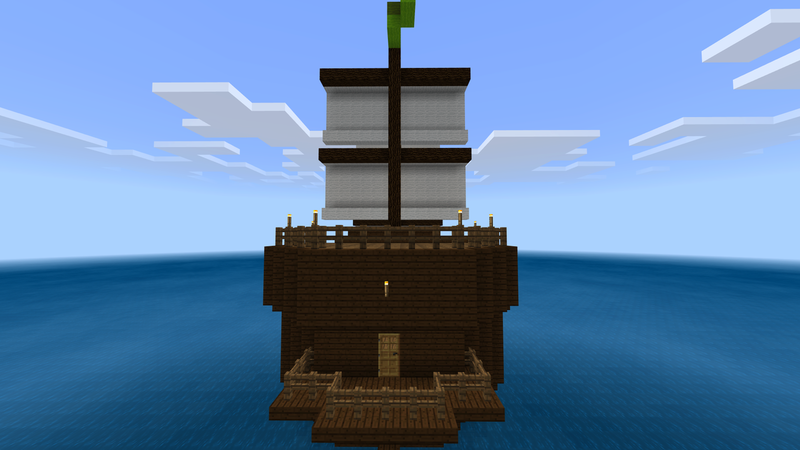 I'm basing it off of the standard Spanish galleon from the Elizabethan era to the late 17th century. Of course, the whipstaff (a primitive form of steering the ship that was later made obsolete by the ship's wheel) has been replaced by the ship's wheel for maximum simplicity. In real life, the ship's wheel / helm was not invented until around ~1705. I have built the ship's hull out of dark oak wood planks, which, assuming it is the same as oak wood all but in color, is entirely accurate as far as my research has shown. 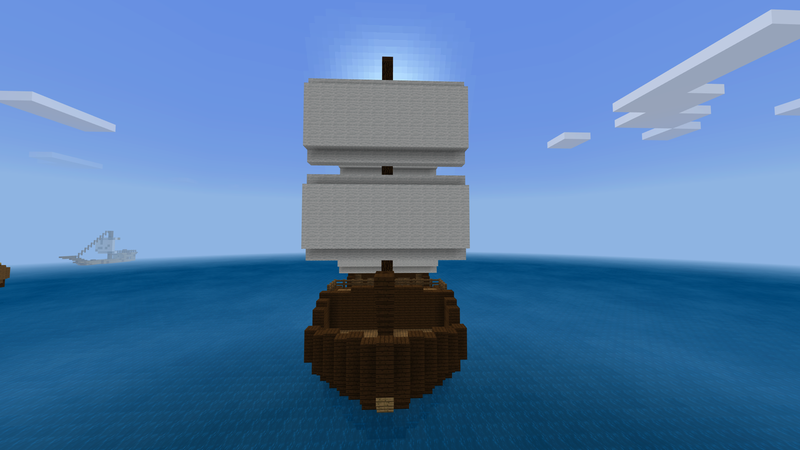 The masts were made of spruce logs, which, again, would be the most accurate to the material for masts as Minecraft can get. The decks have been build out of spruce wood planks for no reason other than aesthetics; this is probably completely inaccurate, but the ship's appearance would be very bland without variation between the hull color and the deck color. There is a lot to show here, but I'll do it as brief as I can. I have not added any rigging with fences yet because it'd get messy and I'd honestly just prefer to wait until we do it with leads. If you guys want I can edit the picture to make it look like there are leads used as rigging. Here is the forecastle (left) and cathead (right) with the bowsprit sticking out. If fishg's statues suggestion were implemented, perhaps we could angle the statues as figureheads at the front of the ship. This is the main deck. Now let's go through the door on the right into the inside of the forecastle. In real life, the sailors would often have this area as their living quarters and they would sleep in hammocks on the gun deck. 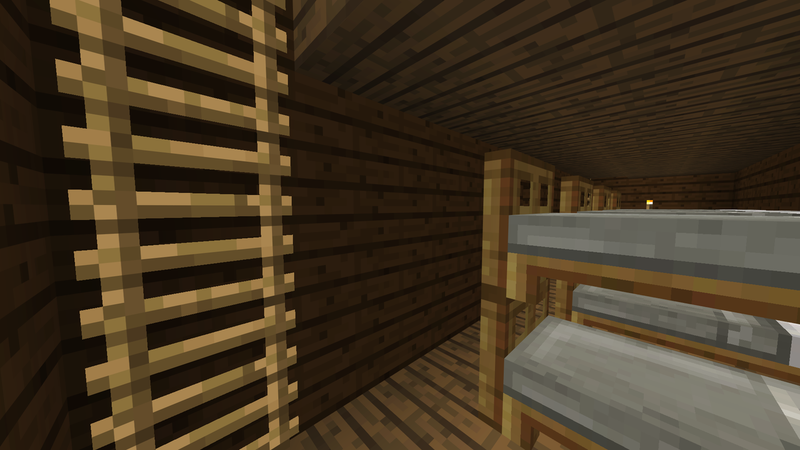 Now, we don't have hammocks in Minecraft, and it'd look weird to have beds placed next to the cannons, so I just filled the forecastle interior with bunk-beds. Currently there are 8 beds in the forecastle and 2 double beds in the captain's/officer's quarters, but many more beds could be added in the future if we deem it necessary. This is another view of the interior of the forecastle. As you can see, there are ladders which allow access to the forecastle deck. The iron block represents the capstan. 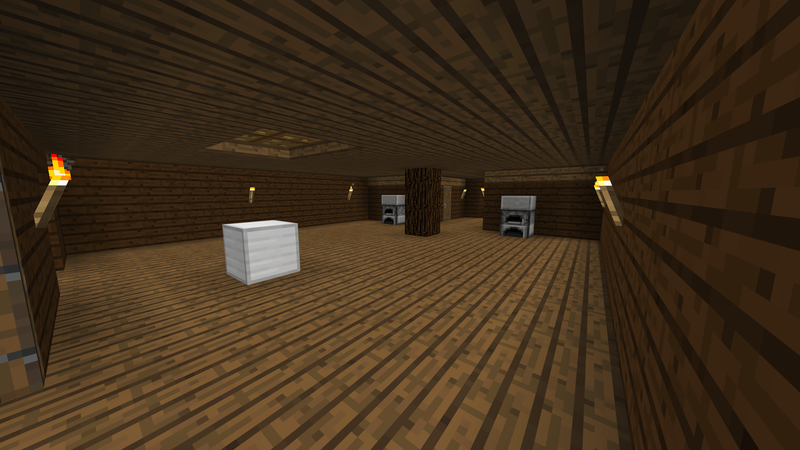 There are little ovens (furnaces) towards the back of the room to cook food in. Here there are three doors. The doors on the left and right each lead into a small room; one is for the captain, and one is for the firstmate or an officer. Above is what each room looks like. 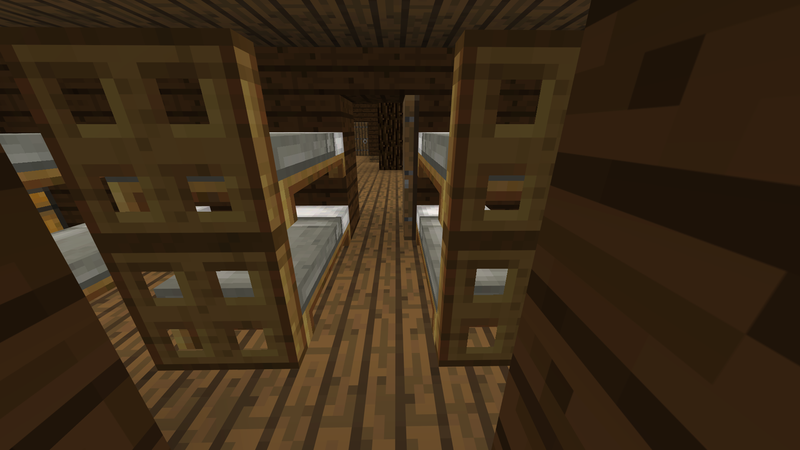 Since there is a lot of space in this area of the ship, more bedrooms (or bunk-beds) could be added. The door in the center leads out to the balcony, which has the view shown above. Here is a view of the ship from the back. 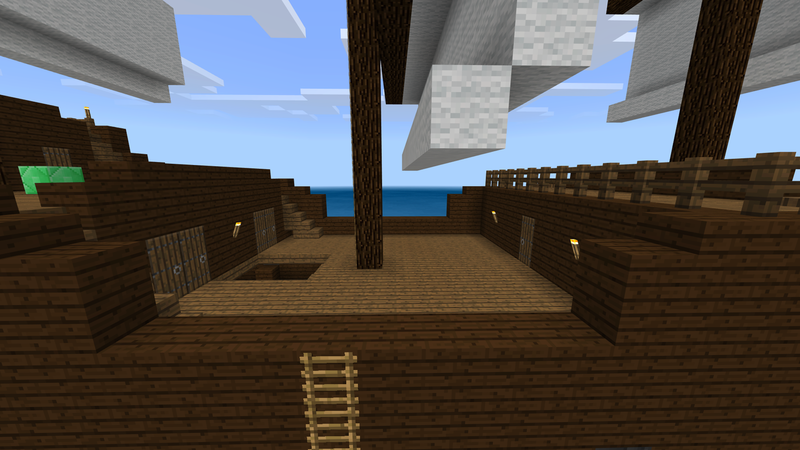 This is the quarter deck (center) and poop deck (far left). 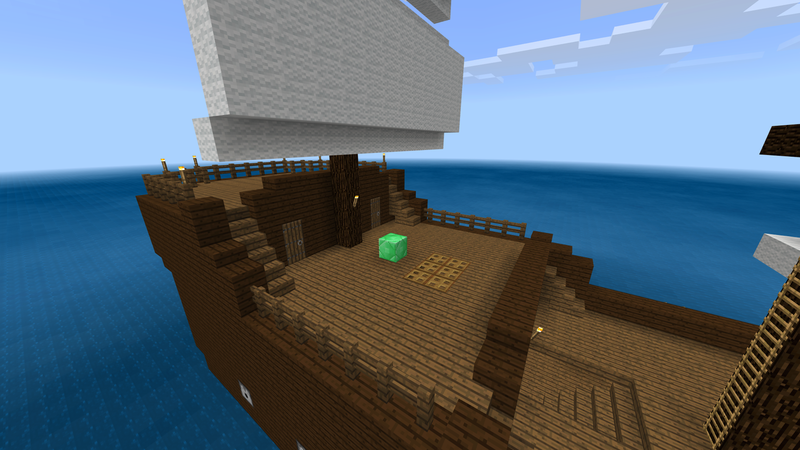 The emerald block represents the ship's wheel. The trapdoors there allow those on the quarter deck to watch and communicate with the people raising anchor with the capstan. 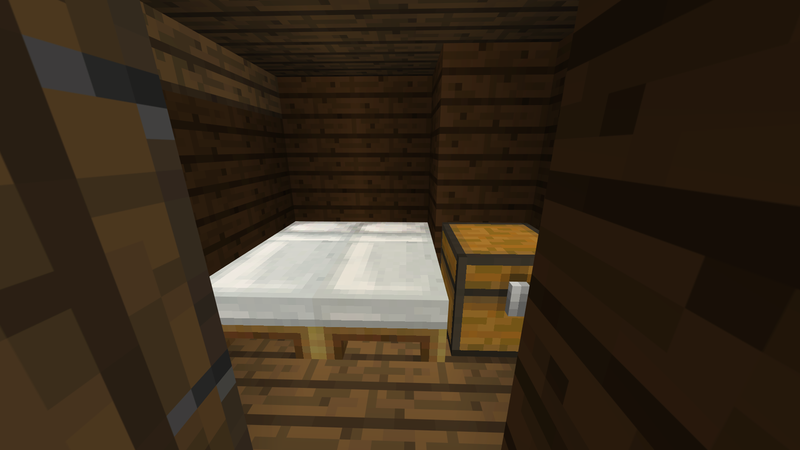 The room adjacent to the quarter deck and ship's wheel would have a table (wooden blocks or upside-down stairs) with a map on it, but the Bedrock Edition currently does not support this, so there's currently not much to show. If you go down the stairs on the main deck you enter the gun deck. Each dispenser represents a cannon. Here there are 14 cannons (7 on each side) and chests with general supplies (cannonballs, string, gunpowder, wool, etc.) in them. If you go down either of the staircases on the gun deck you end up on the bottom deck, the cargo hold (also known as the orlop deck). 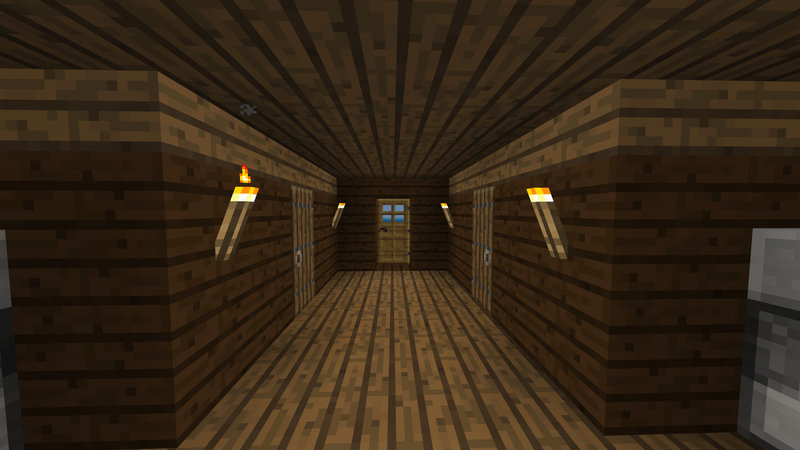 Here there could be pretty much anything– chests (which would be locked, and would anger villagers and iron golems when destroyed), haybales, ores, animals, or other forms of cargo. Well there you go, the mighty galleon! The pictures don't load for me, all I see are white boxes with a gray outline (except the second image). It might be because I'm on mobile tho. That's weird. Now they're doing that for me too. They worked earlier. I'll try and fix it. EDIT: It should be fixed now! Thank you for letting me know! That is what I call a fantastic ship; can't wait for it to properly sail (likely crew 18-20?). A pirate galleon would be quite the terrifying sight if you were puttering around in a rowboat. That is what I call a fantastic ship; can't wait for it to properly sail (likely crew 18-20?). Thanks! Yeah, the crew would be around 20 villagers. A pirate galleon would be quite the terrifying sight if you were puttering around in a rowboat. I like this idea. I support this. The chests have some treasure? The bottom ones might, but they would be guarded. If you were to kill everyone on board (whether it be a merchant ship or pirate ship), taking the "treasure" (cargo– this could be gold, emerald, or even diamonds) would be perfectly fine. Much wider (48 block) detection range and the ability to detect injured Villagers within 16-24 blocks, much like Zombie Pigmen. The ability to use fence gates, ladders, and trapdoors in an intelligent manner as they navigate and generally superior pathfinding (not getting stuck in corners, avoiding long falls, etc.). The ability to utilize Cannons if they belong to a certain profession (e.g. sailors or pirates) to attack enemies/ships within the sight line of the weapon. The ability to pick up weapons if unarmed (so that, say, a trader on a ship can grab a sword dropped by a dead Sailor if they are cornered by Pirates- note that running to an available escape route would be usually prioritized) and to pick up and use items in general. The ability to recognize where a Ship entity ends and so avoid falling into the water even when it is not fenced off. 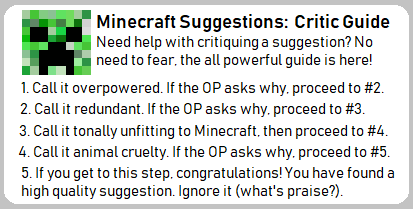 If we do something to make villagers refuse involuntary servitude (like being put in a trading hall or put in a wheat factory) or to discourage players from making villager breeders and farms, that (not the other AI changes) should be made into a module since there are people that really enjoy making villager farms and breeders.